The Chiropractors at the Edenvale Chiropractic Clinic use a variety of techniques in the practice and tailor them to your treatment. These techniques include: Diversified Chiropractic adjustments of the spine, jaw and limbs, massage, fascial release, dry needling, kinesiotaping, athletic taping, electrotherapy, ultrasound, therapeutic stretching, activated isolated stretching, trigger point therapy, FAKTR, active and passive release techniques, proprioceptive neuromuscular facilitation amongst others. Darryn was born and bred in Edenvale. Darryn started off as a paramedic working the East Rand areas for 4 years, he then decided to follow his calling and attended and graduated from the University of Johannesburg with a Masters in Chiropractic. He completed his thesis on the effect of Chiropractic adjustment verses mobilization on local skin temperature. Darryn is an avid sportsman who was selected to represent Gauteng and South Africa numerous times in both tri- and duathlons, and is still currently participating at the highest level in triathlons. He also played water polo for the one of South Africa's most prestigious clubs, and made the South African mens water polo squad. Darryn has since retired from competitive water polo due to working commitments, but he continues to treat participants of all age groups from a variety of sporting backgrounds including water polo, rugby and cycling and multidisciplinary events. Being part of provincial and national teams gives him first hand experience to the ongoing problems and injuries faced by sporting people of all ages. Darryn is currently lecturing Philosophy to first year Chiropractic students at UJ and has been a co-supervisor on a number of clinical research papers presented by UJ. He holds position on the Executive committee for Chirosport South Africa and the Chiropractic Association of South Africa Northvaal branch. Darryn was the first Chiropractor to be awarded the Chirosport South Africa service excellence award in 2014 and 2015. Dr. Gareth Hardie was born and raised in Johannesburg and attended school at St David’s Marist Inanda. He has a Masters in Chiropractic from the University of Johannesburg, one of the highest accredited courses recognised by the European Council of Chiropractic Education. He completed his research on the effect of a Chiropractic Adjustment on Brain Activity, which he presented at the University of Johannesburg’s Dissertation and Thesis competition in 2016. During his studies, Dr. Hardie attained numerous leadership positions including Chairman/Head Delegate for the University of Johannesburg’s World Congress of Chiropractic Students Chapter and Vice Chair for the Student Chiropractic Sports Council. He had the honour of being an Assistant Clinician at the University’s Chiropractic Clinic. He also received Chirosport South Africa Student Chiropractor of the year in 2015. 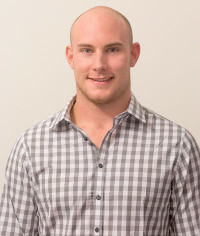 Dr. Hardie joined the Edenvale Chiropractic Clinic in 2016. He treats a wide variety of injuries and/or complaints. Sport is Gareth’s passion and he has treated many sportsmen and women across a number of disciplines, these include but are not limited to rugby, swimming, water polo, cycling, running and horse riding. Both our chiropractors are members of the Chiropractic Association of South Africa, South African Sports Medicine Association and Chirosport South Africa. If you have any questions then contact us today - we look forward to meeting you! Shane grew up in Johannesburg where he worked on the mines. He immigrated to the UK in 2003 where he decided to follow his dreams of studying and working with sports people. He started his studies at Wakefield college in Holistic therapies completing Indian Head massage, Swedish body massage and Reflexology. He then did his diploma in anatomy and physiology and was invited to study Sports massage therapy, he completed his diploma in 2007. While studying he worked with a few rugby teams and had the opportunity of going to the grand final which the team one. He returned to South Africa at the end of 2007 to start his own practice. He worked in Amanzimtoti with a Homeopath until 2012 when he moved back to Johannesburg. While in Durban he worked with various rugby teams from Amanzimtoti rugby club, Durban varsity rugby and Durban Rugby sub Union Juniors and Seniors. He was awarded his Durban Rugby Colours for this. He started his practice in 2012 in Johannesburg and worked in various areas around Edenvale. He then was approached by Edenvale Chiropractic clinic to join their team.